STE Handbook | #3 – WILL MARKETS ALONE DELIVER A DECARBONIZED POWER SYSTEM? #1 – MAKING EUROPE WORLD NUMBER ONE IN RENEWABLE ENERGIES? #3 – WILL MARKETS ALONE DELIVER A DECARBONIZED POWER SYSTEM? #4 – HOW TO MANAGE A HIGH SHARE OF INTERMITTENT RES GENERATION? #5 – What is the environmental footprint of STE technology? 3.1: What is at stake when designing a STE deployment plan? 3.2: What should governments and EU better understand? Governments are supposed to decide on energy policies that address investment needs for the transformation of the whole economy and in specific priority sectors at both national and regional levels. The role of governments is absolutely prominent in the early stages of any green market development or relaunch so to unlock substantial pools of private capital and defining from the outset a clear exit or diminished role over time. 3.3: Why is a “national” energy transition not a sustainable concept? Although energy policy remains across EU a national competence, progress has been made towards integration of the European power system. 3.4: Who is really in charge of making energy transition a reality? 3.5: What can markets deliver towards the energy transition, what not? European energy regulators are since the setup of ACER mainly backing a “technology-neutral”, “market-fits-all” policies. ACER well in line with DG COMP shaped a kind of “magic snapshot of the electricity sector”, a neo-liberal approach according to which obsolete and/or dangerous technologies (nuclear, coal) and/or industries that benefited over decades from massive subsidies of all types should be treated on an equal foot with emerging technologies. What is at stake when designing a STE deployment plan? A fundamental objective of any green growth programmes is about energy and industrialisation objectives trying to maximize positive macroeconomic impacts in the country’s or the region’s economy. 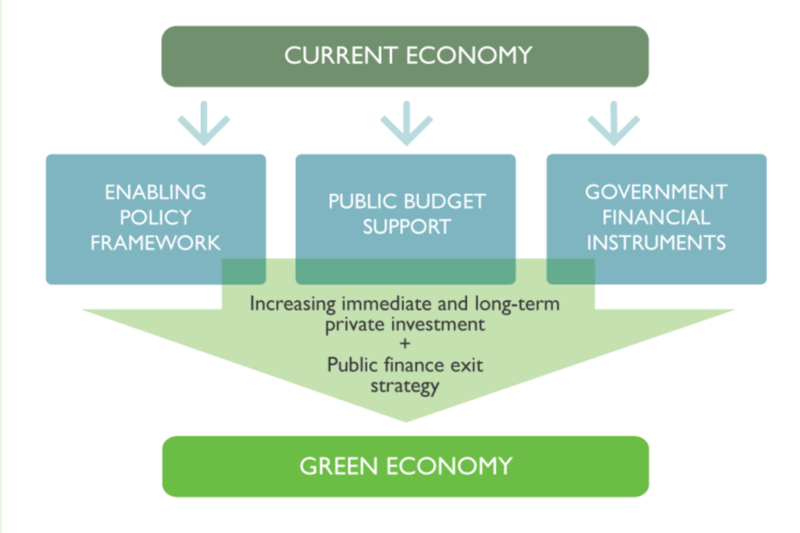 The first objective for policy-makers remains to unlock the investment needed to achieve a transition to “green growth”. However, governments face significant challenges in securing the level of investment needed due to real and perceived investment risks, insufficient returns on investment for some green technologies and practices, competing subsidies and policies, insufficient capacity, information gaps, competing development priorities and other adoption, and regulatory and institutional barriers. Government financing strategies for green growth should therefore seek to encourage green investment opportunities by combining effective use of government policy and funding arrangements with financial risk mitigation instruments. What should governments and EU better understand? Tailored application of financial risk-mitigation instruments to mobilize private green investment. Governments have the greatest success with public finance measures which are integrated if possible, with other national development programs, developed in consultation with the business and finance communities, and tailored to address local investment risks and market constraints. Why is a “national” energy transition not a sustainable concept? The European power system is today a physical entity (more than a single market) where any structural unbalance or any abrupt supply disruption in a given country impacts all participating countries in the system. This alone implies that due care is taken about how to tackle the “grid integration” of intermittent renewables. EU countries claiming that they can manage penetration levels of intermittent generation “of nearly 100%” do in reality either export system stability issues to their neighbours or manage such situations only over short periods (sunny or windy weekends). The reliability of the European power system, i.e. the political perception given to European citizens and businesses that electricity services are secure can no longer build on national strategies only. Especially in a strongly interconnected power system such as the European, the optimal technical and economical objective remains to share the best available resources, including the manageable renewable resources, especially knowing that the penetration of intermittent generation will further increase in the years to come. Who is really in charge of making energy transition a reality? TSOs have no responsibility for system adequacy, i.e. that there is enough capacity on the market to allow them to do their job properly. The TSO role about system adequacy is a role of whistle blowers, no more. TSO do have and will keep supra national and supra regional operational responsibility (i.e. the task of real-time balancing generation and demand) in power systems. In their role of managing the increase amounts of intermittent generation sources, TSOs will no doubt need to better cooperate with DSOs and new agents (independent power producers, “prosumers”, etc.). But political authorities bear in fact the responsibility for the adequacy of the system and the policy framework they provide to markets should be highly efficient to correct shortcomings of strategies considering electricity just as a commodity. The political decision-makers should be aware of the need for a long-term planning strategy that should include the sooner or later unavoidable dismanteling of conventional generation that is today taking up most of the system back-up. What can markets deliver towards the energy transition, what not? The reality was and remains that “technology neutrality” is a fiction (excepted for incumbent market players, or promoters of mature technologies that call for it). Technology is promoted or kept down first of all by the corresponding political framework in which it is embedded. Current markets do not (or not enough) remunerate generation for their effective contribution to system responsibility, nor do they discount priced-in subsidies and/or externalized societal costs (such as industrialization effects, business opportunities, health effects, dismantling costs, etc. European electricity markets turned to financially driven markets – leaving aside the political value of the energy transition. This may soon put the whole energy transition at threat instead of supporting it. Why? either a system with approx. 30% of renewables that a still fossil-fuel based system can more or less cope with, without incentive to go further. Coal, oil and gas industries will come back on stage and …citizens will pay also for their health. or a system in which both the TSOs and the demand will call for a new clean and cost efficient balance between intermittent and non-intermittent generation sources. There will be no more need for manageable CO2-free capacities to increase the overall RES penetration that makes energy transition a reality. All this means that only a clear political support incentivizing a balanced ratio between intermittent and non-intermittent technologies can solve the challenge of achieving an overall RES penetration levels above > 30 % at competitive costs.